Desigual ABAD denim pants for kids. $115.95. Fall-Winter 2016. Desigual baby ELENA sleeper. $69.95. Desigual ROCIO baby T-shirt with fuzzy heart. $45.95. Desigual ROSER leggings with tutu and bow. $49.95. Desigual baby RAFAEL bodysuit with hoodie (it has ears). $99.95. Desigual baby SKATE pants. $49.95. Desigual GUAMUCHIL kids tights. $39.95. Desigual CROSS kids leggings. $39.95. Desigual KANSAS kids T-shirt with bear. $65.95. Desigual SEBASTIAN T-shirt with bear in winter gear. $65.95. Desigual SEBASTIAN T-shirt with bear (back). Desigual “Robert” Funky Monkey T-shirt. $65.95. Back of Desigual “Robert” Funky Monkey T-shirt. $65.95. Desigual Star Wars DROID hoodie T-shirt for kids. $65.95. Back of Desigual Star Wars DROID hoodie T-shirt for kids. $65.95. Desigual LIRIO T-shirt has reversible sequins. Desigual KYLO hoodie T-shirt. $69.95. FW2016. Desigual BORDONABA overalls. $125.95. Fall-Winter 2016. Desigual QUEBEC tunic T-shirt with reversible sequins. $69.95. Desigual KAMPALA dress, back. $85.95. 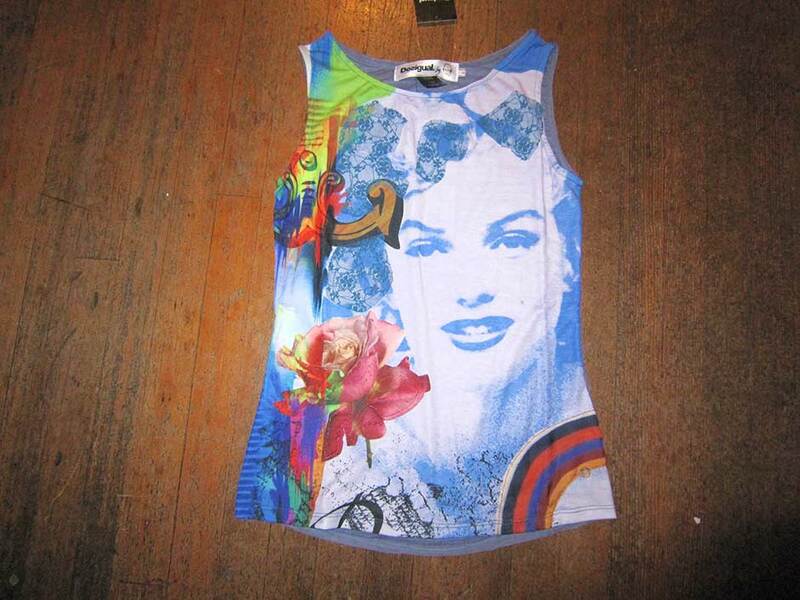 Desigual LANSING dress. $89.95. Fall-Winter 2016. Desigual TRIPOLI dress. $85.95. Fall-Winter 2016. Back of Desigual CAMUS sweatshirt. $105.95. Back of Desigual TRIPOLI dress. $85.95. Desigual CHIVITE baby t-shirt. 3 months to 24 months. Desigual HAIZEA baby T-shirt dress, 3 months to 24 months. Desigual baby EVA coat. Fall-Winter 2016. Desigual SAGUARO denim jacket for kids with knitted sleeves. Fall-Winter 2016. Back of Desigual SAGUARO denim jacket for kids with knitted sleeves. Fall-Winter 2016. Desigual kids LIRIO t-shirt with reversible sequins. It says “Rock ‘n’ Roll” but changes to a skull when the sequins are pushed the other way. The Desigual QUEBEC T-shirt comes in two colours: black & pink. The reversible sequins also change colour from red to silver. This entry was posted in Desigual, Desigual for kids and tagged Desigual for kids Fall-Winter 2016 collection in Vancouver Canada, Gastown, La Vida es Chula (Life is Cool! ), We ship Desigual in Canada. Bookmark the permalink.